As a part of the Policy, Legal and Regulatory (PLR) team’s research and preparatory activity for the drafting of the Global Status of CCS Report 2011, a legal and regulatory scan of the CCS legal and regulatory environment was commissioned from Baker & McKenzie. The study is aimed at providing a comprehensive overview of international, regional, national and sub-national legal and regulatory developments; including details of negotiations currently in progress, the signalled intent of future CCS legal and regulatory decisions and the status of implementation of regulation in a number of countries. Fifty-one jurisdictions were surveyed in total, including the EU’s Member States, Federal and state level jurisdictions in Australia and the US and those developing nations which are the focus of the Institute’s capacity development activities. The Institute’s PLR team worked closely with Baker & McKenzie to develop the scope and format of the research; ensuring a detailed final report and accompanying legislation tables, as well as a process which is potentially replicable in the future. For further information on this study, please contact Ian Havercroft, Senior Advisor – CCS Regulation. CCS policy will ultimately be driven by the western Canadian provinces, which need CCS to be aviable alternative to dramatic emissions reductions. To date, the focus in Canada has been onfunding pilot CCS projects and not developing a coherent set of standards for the proper implementation of CCS activities. In order to encourage CCS project development, Canadian jurisdictions will need to develop regulatoryframeworks able to deal with the unique qualities of CCS projects. Existing pipelines and mininglegislation could be adapted to this purpose. There is no integrated policy or legislation currently to specifically deal with CCS in the Republic of South Africa (South Africa). 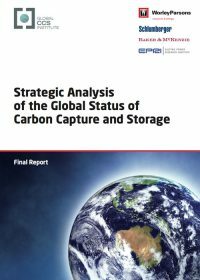 However, in recent years South Africa has moved towards adopting a climate change policy, and CCS is likely to be central to that policy.The Long Term Mitigation Scenario Study (LTMS) highlighted CCS as being a potential method of CO2 emissions mitigation for South Africa. 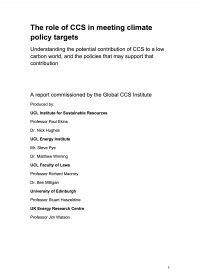 Following this study, the Department of Environmental Affairs and Tourism (DEAT) stated that one of its objectives was "exploring and developing CCS forcoal fired power stations and all coal-to-liquid (CTL) plants, and not to approve new coal fired power stations without CO2 capture readiness". DEAT also stated that a climate change policy is expected to be implemented by 2010 and a legislative, regulatory and fiscal package is planned to be introducedby 2012. It is therefore clear that CCS is expected to play a vital role in South Africa's drive to mitigate its CO2 emissions. The South African government has declared CCS to be a national research priority and this commitment is underlined by South Africa's membership of the CSLF since 2003.The recently established South African National Energy Research Institute (SANERI) launched a National Centre for CCS on 27 March 2009. This research centre will drive CCS initiatives in South Africa, with the ultimate goal of undertaking a CO2 injection experiment by 2016 and the constructionof a CCS demonstration plant by 2020. The Centre receives funding from the British High Commission, the Norwegian Government and from industry. South Korea does not currently have any policies or legislation dedicated to encouraging thedevelopment of CCS technologies or regulating the conduct of CCS projects in South Korea.However, South Korea began considering the development of CCS policies and legislation in 2008and this policy development process continues. The Government is currently promoting the development of technology for capturing CO2. The legal basis for such government support is the Energy Basic Law. Brazil does not currently have any integrated policies or legislation dedicated to encouraging thedevelopment of CCS technologies or regulating the conduct of CCS projects in Brazil. There are noproposals for CCS draft polices or legislation at a National or State level. The National Plan onClimate Change has, however, identified climate change as a strategic issue for both the present andthe future of national development. Existing environmental, health and safety legislation may be applicable to particular CCS activities.The legislation may also provide an insight into how Brazil might incorporate the regulation of CCSactivities within existing regulatory regimes or create new CCS specific legislation in the future. No integrated legislative framework is currently enacted in the UAE in relation to the capture andsequestration of CO2 emissions. There is, however, a large amount of government investment to support related projects which,alongside various related commercial partnerships, is aimed at capturing up to one third of the emirateof Abu Dhabi's CO2 emissions by 2020.
integrated CCS legislation at the Federal, Victorian and Queensland levels, which provides certainty to to market participants and clearly set out systems of property rights and liability regimes. From now until 2020, the PRC aims to spend a significant portion of its own GDP on technology research and development. GHG reduction initiatives such as CCS could capture a significant portion of those funds.